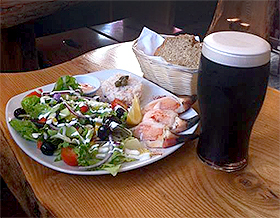 Tigh Ned is a traditional family run seafood pub within a stone’s throw of the pier. Lunch is served daily throughout the summer months. Daily specials include locally caught crab and lobster. The beer garden to the front of the pub, with views of the Atlantic, Galway Bay and the Clare coastline, is the perfect place to spend your afternoon.